Photograph of crowds of Berliners listening to Joseph Goebbels's speach. 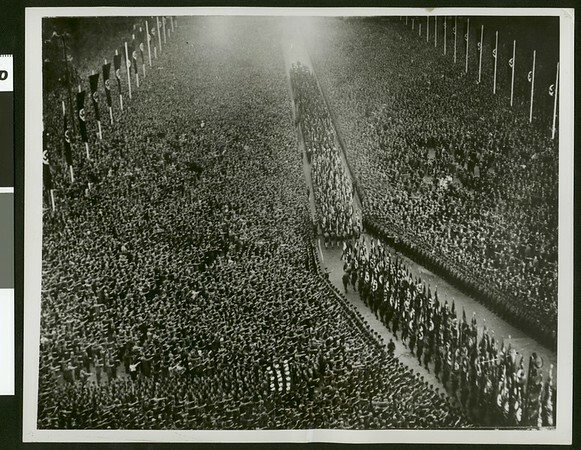 "Wide World Photo | Please watch your credit | 898658 | When Berlin crowds listened to Goebbels | Berlin, Germany. This was the scene as thousands of Berliners gathered in the Lustgarten Sept. 26 to listen to a speech by Propaganda Minister Joseph Goebbels, who declared that he foresaw a peaceful solution of the Sudeten-German dispute "within a few days". "I, as a man in the know of things", he declared, "can tell you we neither can nor want to retreat, as the Fuehrer [sic] has pledged his word to support the Sudetens, but the solution is imminent". N-10/6/38 (s)" -- typed note attached to verso. "Received. Examiner reference library. Oct 12, 1938" -- stamped on verso.